Of late, I was less than kindly reminded (unintentionally, I'm sure) that I am not a native New Yorker. That privilege can only be claimed by those who were born in a local hospital, lived through the "rough years when NYC was real," went to public schools (or now pretend they did to add to their authenticity), and if they went to college outside of NYC they came back every weekend because there's "nothing to do out there." Personally, I'd argue that I know a lot more than some natives about NYC, or Brooklyn at least, from teaching in the public school system for 12 years, but I don't think that's a discussion I care to have. So that mini-rant got me thinking about how I've adapted to things in Brooklyn. Some good, some not so good. Now that the weather is better, for example, going to the park is a whole new adventure. Local drunks (twice this week police and ambulances were called to pick up men who could not be woken up) and the organic material they leave behind, lots and lots of glass that toddlers enjoy picking up and tasting, inconsideration of others brought on by anonymity all make up part of the experience that is visiting the park. I don't usually share those details with friends and family outside of Brooklyn because the reactions force me to acknowledge that I really have adjusted what is acceptable. And the fact is, I enjoy utilizing the park. I like that there are kids and parents who share their balls and tricycles despite language barriers. I like that there is lots of grass and equipment and space to explore. I like that it's an easy place to meet up with others who also enjoy the park despite some of the drawbacks. I especially like that there are several parks/playgrounds within easy walking distance. That's not something many towns can claim. So anyway, this poem by W. H. Auden references the ability to adapt and accept sometimes shockingly severe changes. Adaptation can mean survival, but it can also mean complacency. Perhaps what annoys some native New Yorkers about New Comers is that the short-comings of our (yes, I used the possessive! mine!) City are not as ignored by those of us who grew up with different circumstances. It's not a bad thing to want the glass cleaned up from around the trees. It's not a bad thing to want the passed out and perhaps severely damaged drunk man to be assisted and made to answer for his choices. It's not a bad thing to want broken playground equipment to be repaired. It's just not. However, there are plenty of things that should be smoothly accepted. For example, sometimes you need to use sign-language to tell the stylist what kind of cut you want. Sometimes you need to walk around the never-ending stoop sales on your block and on the way to the train. Sometimes you need to learn a few phrases (or more) in different languages so that you can say "thank you" and "excuse me" to others who live in the neighborhood. Okay, and sometimes you might need to learn a phrase that's a little more specific to tell someone to keep his opinions to himself. I've found that, "Como? Que quieres decirme?" works really well to get some silence on the corner. 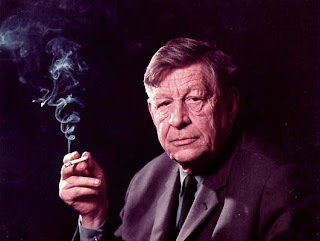 But back to Auden. Here are a couple of stanzas from his poem that I interpret to be about adaptation. from "The More Loving One"
Beautiful post and lovely poem! I'm a new comer here, too (arrived last August), but I love NYC and I love Brooklyn! Not very many people (other transplants here and friends across the country) understand my love. To them, this city has more negative than positive, which may well be true. But if I lived with that attitude, I'd be miserable. Sometimes when life puts something different on your plate, it's better to learn to love it -- especially if you're going to be eating every day. So that's what I've done. And I couldn't be happier. Living in this city is a grand adventure and I want to soak up every bit of it that I can. Interesting blog!! I hope to be able to read some more interesting poems!